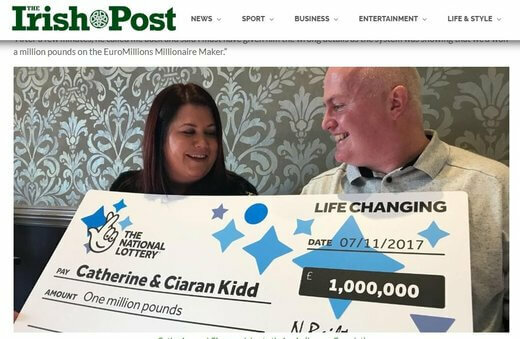 Catherine plays the EuroMillions lottery online. When she received a letter from the lottery informing she was a winner, she couldn’t check the prize at the office computer. She just assumed she’d won a lucky dip as usual. It was far from that though! She phoned her husband to check and he almost immediately phoned back saying she must have given him the wrong details. Because it’s saying they had won the Euromillions Millionaire Raffle — for a cool £1 million. They were stunned but kept their composure and Catherine called Camelot who confirmed their win. She had to finish her shift but she and her husband just hugged each other when she got home. They began celebrating at the hotel where they were wed 12 years ago. They feel blessed to have won and say this only just goes to show, anyone can win — if they buy a ticket!